Promotional Line: "A screwball comedy. Remember them?" Producer/director Peter Bogdanovich's, "What's Up, Doc?" is a fun, fast paced screwball comedy. It has "nonstop action, improbable romance, and great performances," in the spirit of the great 1930's screwball comedies. 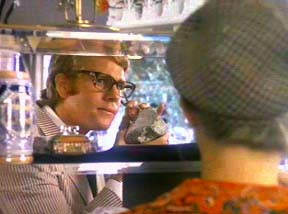 The basic story tells the tale of what happened when a bright, but strange young woman, Judy Maxwell (Streisand) a confused, accident-prone Iowa rock Musicologist, Howard Bannister (Ryan O'Neal) his bossy fiancee, Eunice Burns (Madeline Kahn) and others all intermingle at a swanky hotel. Howard Bannister, and his fiancee, Eunice, have come to this swanky, San Francisco hotel to compete for a musicology research grant. Hilarious havoc reigns the moment that a conniving, strange young college student, Judy Maxwell, attaches herself to Howard, in a drug store where they met at random. The underlying plot has to do with all the identical plaid suitcases, that wind up getting mixed up, due to the confusion of the bad guys. The two story lines come together at the end, for hilarious consequences. 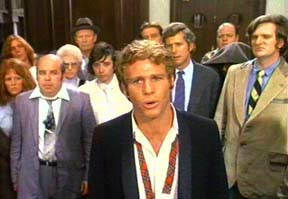 The cast includes Barbara Streisand, Ryan O' Neal, Kenneth Mars, Austin Pendleton, Sorrell Booke, Michael Murphy, and Madeline Kahn. This was Kahn's first movie. The cast works together in great comedic ensemble work, that makes this wonderful screenplay work. Streisand can do a comedic part extremely well, as well as sing, and Ryan O'Neal is great as her straight man who plays this klutzy, absent-minded scientist in a natural and believable way. Austin Pendleton, who plays Frederick Larrabee, the sponsor of the grant, and Kenneth Mars, who plays the dishonest, arrogant Hugh Simon, Howard's competition for the grant, both offer terrific supporting actor performances that add much to the film. One of my favorite scenes takes place under a table, at a gem and rock convention dinner. Howard comes down to the dining room alone, because Eunice was still getting ready up in her room, and would come down later. He finds his table, and to his horror, this crazy Judy woman is wearing Eunice's name tag, pretending to be her. Frederick Larrabee, is sitting next to her, and finds her very amusing, calling her Burnsy, lapping up all the good things she is saying about Howard. After Howard has sat down next to Judy, he deliberately drops his napkin and he and Judy both go under the table for a private talk concerning why she is there, and what to do about Eunice, who was due to arrive in the dining room at any time. After a funny exchange of clever and witty lines between the two of them, the rest of the guests at their round dinner table wind up joining them there with hilarious results. The head waiter, as he sees the guests seated at this table entirely under the tablecloth, he asks the waiter who was serving this table,"What kind of wine are you serving them?" 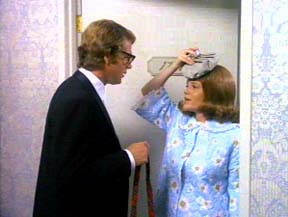 Madeline Kahn is extremely funny in this film. Her reaction is priceless, when she arrives at the dining room, only to be humiliated when Howard says he doesn't know her. Waiters have to drag her out, over her loud, funny demonstrative protests. Another one of my favorite sequences of scenes takes place during a wild, wacky, and really well choreographed chase scene through the streets of San Francisco. This film will cheer up anyone and improve anyone's mood. It is great entertainment meant for the entire family. If you enjoyed WHAT'S UP, DOC? you may like "The Owl and the Pussycat," "Paper Moon," "Bringing Up Baby," "The Awful Truth," "The Philadelphia Story," "My Man Godfrey," and/or "Town and Country."